There was a lot of hype about this young restaurant; it was in the New York Times food section. 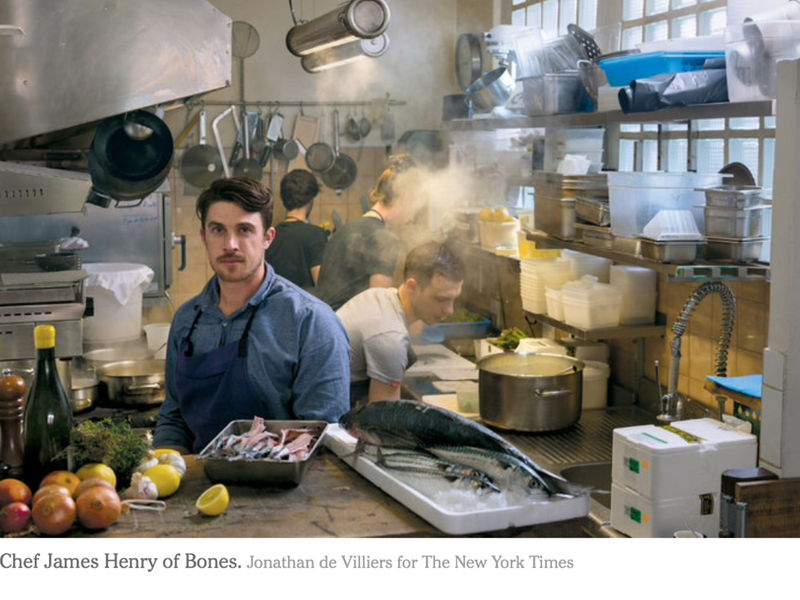 This article talked about how foreigners like head chef James Henry from Australia are re-shaping the restaurant world in Paris. I’ve been wanting to go since it opened a year ago. When I entered the restaurant, I felt different. Visceral. Decidedly modern. The new Paris. It cut away the gristle, the airs, the smoky mirrors, the fat. And just leaving the bare bones. It’s gritty, authentic, hipster. Everything is covered with a slight patine of skater grime. Even the chef is a bit oily, like he’s been working in the coal mines. I spent the evening solo at the bar. Different groups of others in the restaurant industry flowed through, ordering smoky, heady wines. One smelled just like foie gras. Some were kind enough to share a glass with me. I got the tasting menu, and also tasted some of the small bites to share at the bar. The food was clean and honest. I started with a barbecue smoked oyster, and the sweetbreads for the main were perfectly cooked. The ingredients were bright, locally sourced. The food lacked a bit of body and acidity. This is where the French excel – layers of flavors. But also French can be too subtle and a bit boring if not done correctly. But that’s how this place rolls. It’s about transparency at the skeletal level. There are no airs. You know all that food was fresh and properly cared for. Head chef James Henry is intensely humble, and really a “beau gosse,” (stud or a hunk in French). His gaze pierces though the blue metallic haze. He flicks his superman James Dean-esque curl of hair in front while checking out the dining room. Every so often he walks to the bar and greets another fellow chef or restaurant owner. In his story about how he got to Paris, he was just on vacation and ended up staying. He worked at Spring, another gastronomic restaurant opened by American chef Daniel Rose. I love these REAL places. The cooks in the open kitchen keeps an eye on the diners to see how they’re enjoying the meal, and sends little plates over throughout to heighten my experience. The bartenders make each drink with care, and slice the charcuterie to order. The New York Times was really right in that French cuisine really needed a shake up. And Bones is doing something right. The ambience keeps you coming back. For a good time with friends at one of the most authentic places in town, go to Bones. Have a cocktail. Order some small plates at the bar. And experience this more hip, honest side of Paris dining.